A series of slangy panels, culminating in an air glockenspiel (a percussion counterpart of the air guitar, quite possibly a simulation of playing an electric glockenspiel). A glockenspiel gets into it because so many people think the word glockenspiel is silly. a musical percussion instrument having a set of tuned metal pieces mounted in a frame and struck with small hammers. A glockenspiel … is a percussion instrument composed of a set of tuned keys arranged in the fashion of the keyboard of a piano. 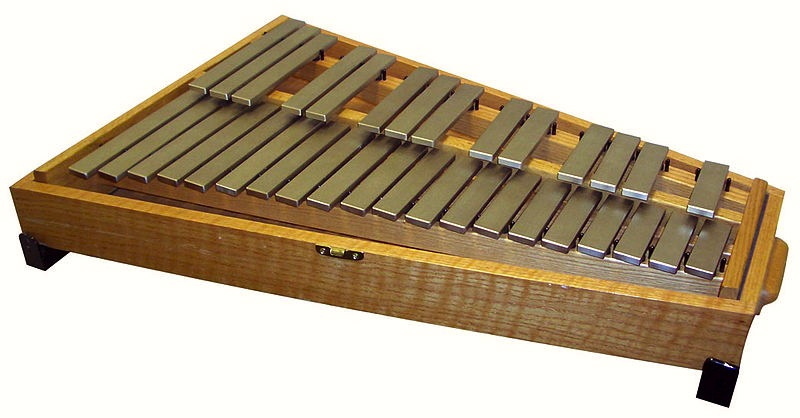 In this way, it is similar to the xylophone; however, the xylophone’s bars are made of wood, while the glockenspiel’s are metal plates or tubes, thus making it a metallophone. The glockenspiel, moreover, is usually smaller and higher in pitch. … Two well-known classical pieces that uses the glockenspiel are Handel’s Saul and Mozart’s Die Zauberflöte, both of which originally used instruments constructed using bells rather than bars to produce their sound. Papageno: Ich Narr vergass der Zauberdinge! Ich muss mein liebes Mädchen seh’n! It works, and Papageno and Papagena go on to sing a sweet duet. This entry was posted on July 30, 2013 at 7:35 am and is filed under Linguistics in the comics, Music, Silliness, Slang, Words. You can follow any responses to this entry through the RSS 2.0 feed. You can leave a response, or trackback from your own site.